In the weird and wonderful world of Arkadia, old king Fedoor has no heir. A grand tournament is being organized, with the throne going to the kingdom's finest adventurer. 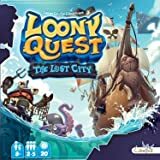 Competing champions will travel through seven amazing worlds inhabited by the Loonies: crazy creatures that like nothing better than a good fight... To win the crown, however, champions will also have to avoid their rivals' sneaky tricks! Jungle World (World 1) -> 6 levels. Ice World (World 2) -> 6 levels. Desert World (World 3) -> 6 levels. Temple World (World 4) -> 6 levels. Magma World (World 5) -> 6 levels. Mechanical World (World 6) -> 6 levels. Epic World (World 7) -> 4 levels. 3 base boards (with a white front and colored rear). 4 5 erasable marker pens with eraser caps. 5 1 game console (box base and plastic insert). 6 1 score track running around the game console inside the game box. 7 1 console base (card board to be placed on the console). 8 1 sand timer (30 seconds). 9 5 score tokens, to record points on the score track. 10 5 character tokens, to identify the players. 11 28 Bonus tokens: (Pranks and Power-Ups): 5 Broom, 8 Banana, 5 Shield, 5 Mosquito and 5 XP tokens. 12 24 Penalty tokens: 4 Cyclops, 5 Cramp, 5 Switch, 5 Claw and 5 Vortex tokens. Each player is a champion attempting to gain as many Experience Points as possible while travelling through one of Arkadia's 7 Worlds. Each World (except the seventh one) is divided into 6 levels, with a fearsome Boss defending the final level. 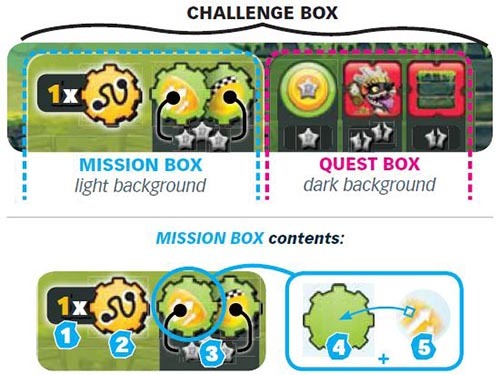 Each level 1 has missions that the players attempt to accomplish in a limited time, by drawing what is required by the Challenge Box 2 on their screen 3 4. When the allotted time has elapsed, each player places their screen over the level sheet 5, checks whether or not their drawings are valid, records any Experience Points earned and where appropriate collects Bonus or Penalty tokens. But watch out for Traps! The player with the most Experience Points when all levels in the World have been played is declared the winner. Each player takes a Character token 1 and matching score token 2, a marker pen 3 and a screen 4. The screen should be placed on a base board (with the white side visible). Place the console base 6 on the game console 7. Stack the score tokens, beginning with the youngest player's token and ending with oldest player's token. Set up the game console in the middle of the play area, the same distance from all the players. The first pile is called the Bonus pile, the second one is called the Penalty pile. 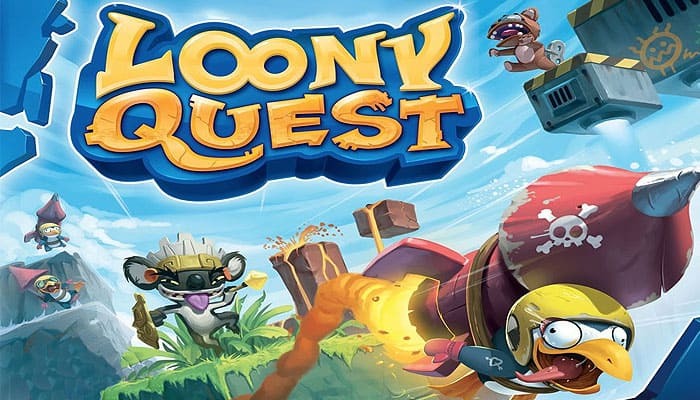 Choose one of the seven Worlds 11 (World 1 to 7) and place that World's first level (level 1) on the game console. The seven Worlds are numbered in ascending order of difficulty. For your first game, we recommend beginning with World 1 and playing the other Worlds in order in subsequent games. Before beginning the game, you must select the play mode: normal or arcade (more difficult). The following rules apply to normal mode. The players observe the chosen level and familiarize themselves with the mission. 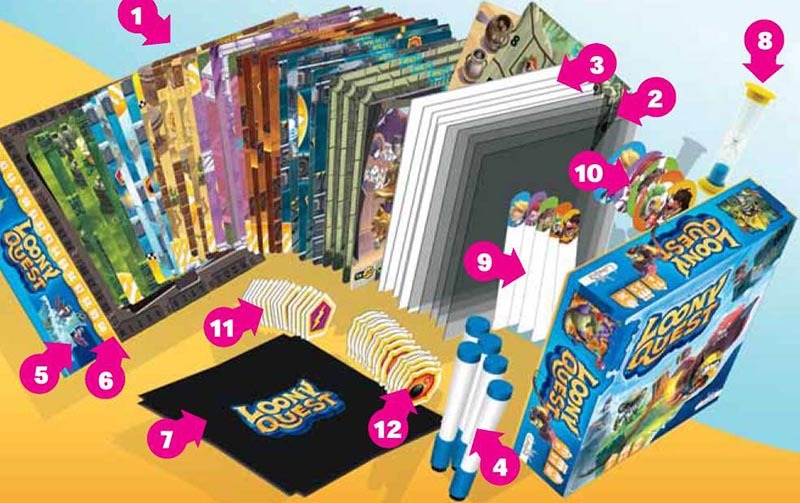 Each player may choose to play any or all of their Prank tokens, allocating them to one or more opponents. The player with the highest score allocates their tokens first. The other players then do likewise, in descending score order. During this phase, the effects of any Penalty tokens are activated automatically. Flip the sand timer. All players may begin drawing. They have 30 seconds to draw the forms required for the mission on their screen. When the timer ends, all players must stop drawing. Scores are then determined. Note: players may erase any or all of their drawing provided the allotted time has not elapsed. The player with the highest score places their screen on top of the current level sheet and checks whether their drawings are valid. Valid drawings are rewarded with Experience Points. The other players then do likewise, in descending score order. 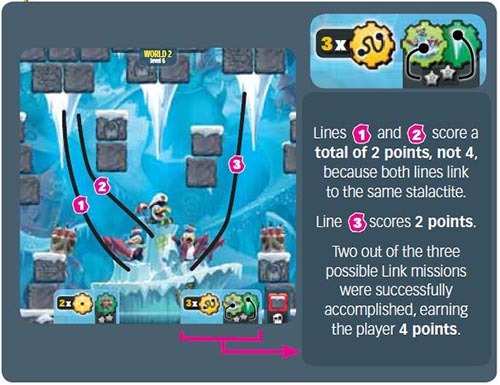 Note: when scoring the first level, the player whose token is on the top of the pile scores their level first, followed by the other players in order. If any Bonus or Penalty tokens were played during the level, place them face down under the Bonus and Penalty Piles. Then remove the current level from the game console and replace it with the next level. The new level should be rotated clockwise by a quarter-turn relative to the orientation of the previous level. Note: each player produces their drawings based on their view of the level, with no need to rotate their screen when placing it on the level sheet. Play continues in the same way for all levels in the chosen World. When the final level has been played, including the confrontation with the Boss, the player with the most Experience Points is declared the winner. Drawings must never touch or branch. If they do, the drawing(s) concerned are not valid. Only valid drawings are scored. A player's drawings are all declared invalid if the screen contains a type of drawing not specified in the Mission Box. That player will not earn any Experience Points for the level. The maximum number of drawings specified in the Mission Box must not be exceeded. Exceeding this limit invalidates all of a player's drawings. That player will not earn any Experience Points for the level. 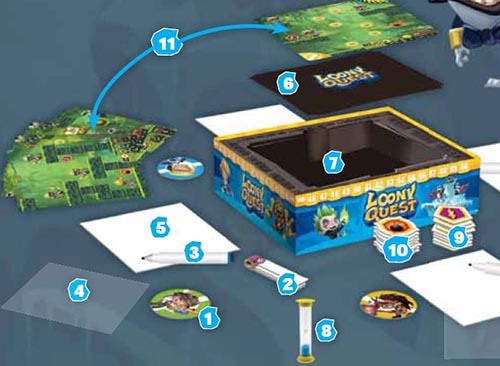 The bottom of each level sheet contains the Challenge Box, which describes the objectives for the level: the main mission and any side quests. 1 This number shows how many times a player may perform the mission. 2 The mission icon shows the mission type for the level. Note: certain levels require players to perform more than one type of mission. 3 The Experience Points block shows the number of Experience Points gained each time the mission is performed successfully. 4 The Mission Target and related Mission Item indicate which Items are needed in order to accomplish the mission. 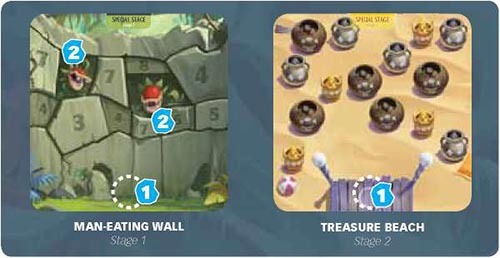 1 The Quest Target and related 2 Quest Item show which Items to touch , and which Items (or Traps) must be avoided . 3 The Experience Points block shows the number of Experience Points gained or lostwhenever a valid drawing touches the relevant Quest Item. Note: the Mission Box and Quest Box are totally independent. This means that a player can still win or lose quest points even if they did not accomplish a mission. Link: players must draw a line on their screens that will link the two Items present in the two Mission Targets ( ). A Link mission is considered to be successfully accomplished if the line begins inside the Item located in the first Mission Target and ends inside the Item located in the second Mission Target. Move: players must draw a line on their screens. Move mission can only be successful if the line begins inside the Mission Item. The line ' may end anywhere on the level without affecting the result. Ring: players must draw a ring around each Mission Item on their screens. For a Ring mission to be successful, each closed contour (regardless of its shape) must enclose the exact number of Items specified in the Mission Target. Ringed items must not overlap the contour of the ring. Mark: players must draw a dot on their screens. For a Mark mission to be successful, each dot must touch the required Mission Item. 30 Seconds icon: the «30 Seconds» mission icon appears on some levels. In such cases, players may observe the level for 30 seconds (measured by the sand timer). When the allotted time has elapsed, turn over the level sheet (players may not look at it again). Start the timer again. The players must then draw the requested mission on their screens from memory. Replace the level sheet in its original position on the game console in order to determine players' scores. Each successful mission scores the number of Experience Points shown in the related block. The Mission Target will be shown in light green if the required Item only appears in the level once. The Mission Target will be shown in dark green if the Item appears multiple times. When a player is able to accomplish a mission more than once (for example: ), a different Item (shown in a dark green Mission Target ) must be used for each mission. Touching an Item located inside a green Quest Target scores the related number of Experience Points. These points may only be earned once per Item, even if it is touched more than once by one or more valid drawings. Touching a Trap in a red Quest Target causes the player to lose the related number of Experience Points each time the Trap is touched by a different valid drawing. If a valid drawing touches a Quest Item associated with a Skull, the player scores NO Experience Points for the whole level. A player's score is calculated by totaling the Experience Points earned and/or lost via the Mission Box and the Quest Box. After calculating the number of Experience Points earned, the player moves their score token forward the appropriate number of spaces on the score track. If a player's score token would land on a space already occupied by another player's score token, move it to the next free space instead. A player does not lose points on the score track if they earn a negative number of Experience Points on a level. Their score token remains where it is. Note: only valid drawings are scored (see page 4 - Validity of drawings). 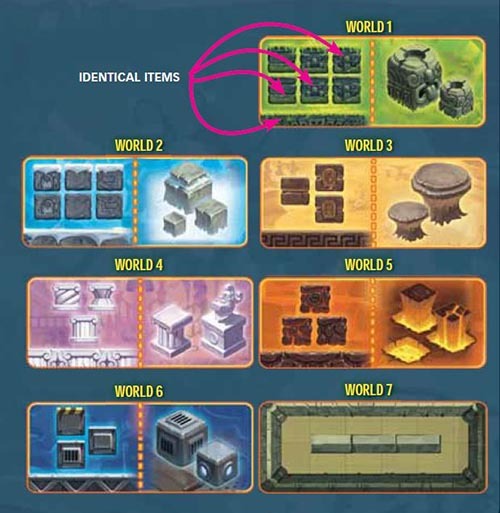 1 The level details box. 2 Scenery Items not located in a Mission or Quest Target. Sometimes, only part of a Mission or Quest Item may appear inside the corresponding Target area. Nevertheless, the whole Item is considered when performing a mission or quest. Note: an Item's shadow is not part of the Item and should be ignored when determining scores. Some Quest Items have graphic details give them a different visual appearance. However, when determining Experience Points, Items belonging to a particular family are treated as identical, even if they are not all shown in a Quest Target. On some levels, players can obtain Bonus and Penalty tokens. During the scoring phase, whenever a Bonus icon is touched by a valid drawing, the player wins a Bonus token. Similarly, whenever a Penalty icon is touched by a drawing - regardless whether the drawing is valid or invalid - the player collects a Penalty token. When a player is awarded a Bonus or Penalty token, they draw the top token from the relevant pile and place it face up in front of them. If a player draws two or more identical Penalty tokens, they keep only one and place the others face down at the bottom of the Penalty pile. Note: collect only one Bonus or Penalty token per icon, even if the icon is touched multiple times by one or more drawings. 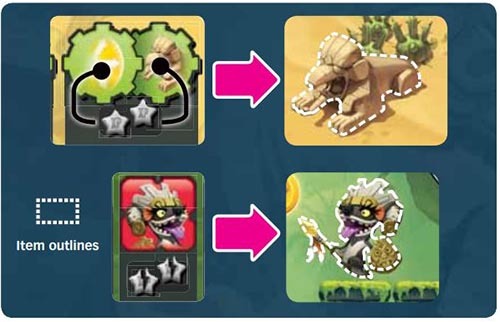 There are 5 different types of Bonus, organized in 2 categories: Pranks and Power-Ups. Prank Bonuses are activated during the Play Pranks step. Banana: a player who has a Banana may toss it onto the screen of an opponent of their choice. A player who has a Banana on their screen is not allowed to move the Banana or rotate their screen. During the current level, the Banana prevents the affected player from drawing at its location. Note: bananas must be tossed onto the opponent's screen, not placed on it precisely. If the Banana falls off the screen, the player may throw it again. Mosquito: a player who has a Mosquito Bonus may give it to an opponent of their choice. The player receiving the Mosquito token must balance it on the end of their marker pen. The token must not fall off while they are drawing. If the token falls off, the player must balance it on their marker pen again before resuming drawing. Broom: a player who has a Broom Bonus may pass one of their Penalty tokens to another player of their choice. Note: a Broom cannot be used to brush away a Prank token! Power-Ups are activated during the Scoring step. Shield: a player who has a Shield may choose to cancel a loss of Experience Points caused by a Trap . 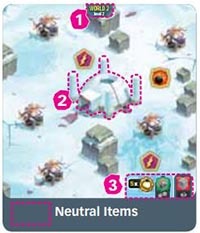 If a player touches more than one Trap, they may choose which Trap is ignored (even if the chosen Trap is touched by more than one drawing). XP: a player who has an XP Bonus may discard it during the Scoring step and move their score token forward two additional spaces on the score track. During the next Mission step, the effect of each player's Penalty tokens is activated for the full duration of the timer. There are 5 different types of Penalty. Cramp: a player affected by a Cramp must draw with their arm held totally straight, without bending their elbow. Note: players affected by a Cramp Penalty are not allowed to stand up. Claw: a player affected by a Claw Penalty must hold their marker pen in a pincer grip using their thumb and little finger only. Vortex: a player affected by a Vortex Penalty must flip their base board onto its colored side and place their screen on it. The base board is returned to its normal (white) side after the next scoring step. Switch: a right-handed player affected by a Switch Penalty must draw with their left hand, and vice versa. Cyclops: a player affected by a Cyclops Penalty must close one eye. Certain levels feature a Key and a Cage. If a valid line drawn by a player touches the Key AND the Cage, the player collects the number of Experience Points shown inside the Cage . Note: there is no need to touch the Experience coins inside the Cage. Touching any part of the Cage is enough. On levels 6.1, 6.5 and 7.2, certain areas are defined by a barrier and a laser of the same color. A player's line may not enter such areas unless the Laser and barrier have been disabled. To do this, the player's line must touch the relevant button before entering the area. If a player's line enters an area while the Laser and barrier are still active, the portion of the line beyond that point is erased before scoring the level. Selects one of the two sides of the Special stage sheet and immediately plays that level before the next player determines their score. Positions their Character token on the designated spot 1 and flicks it forward. The player does not score any Experience Points if their token leaves the level sheet. If any part of the token remains on the level sheet, the player determines their score. The player scores the number of Experience Points shown in the highest-value space touched by their Character token. If their Character token touches a space containing a man-eating plant 2, the player does not score any points. The player scores the number of Experience Points obtained by adding together the values of all the pots touched by their Character token. For each new level, before starting the timer, reveal the Penalty token on the top of the Penalty pile. This Penalty effect applies to all players. This Penalty token is known as the Common Penalty. Its effect applies cumulatively with any active individual Penalties. If a player has a Penalty token of the same type as the Common Penalty, they should immediately place their token under the Penalty pile.